He added that he understands that people staying in the region have faced problems. The program, which was stuck from decades will finally reach its destination, he said. 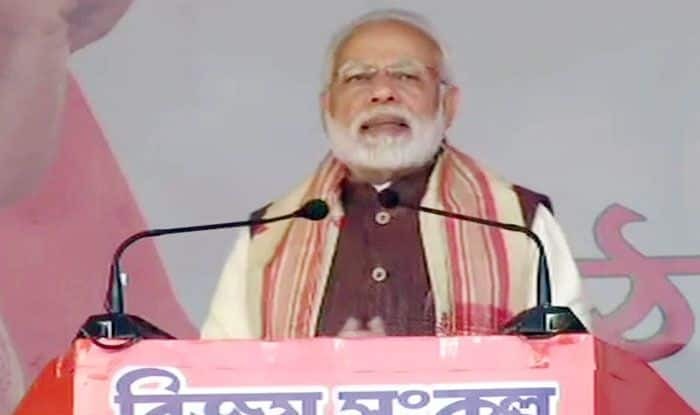 Silchar: Prime Minister Narendra Modi on Friday began the campaign for the polls in Assam from Silchar in Barak Valley. While addressing a rally in Assam’s Silchar, PM Modi assured the people residing there that none of the Indian citizens will be left out in the National Register of Citizens of India (NRC). PM Modi said, “Aapko fir se bharosa deta hoon, koi bhi bharatiya nagrik National Register of Citizens of India (NRC) mein se nahi chootega.” He added that he understands that people staying in the region have faced problems. The program, which was stuck from decades will finally reach its destination, he said. He further said that his government is also working to get the Citizen Amendment Bill passed in the Parliament. Citing that the Citizenship Bill is an atonement of the wrong that was done during the partition, PM Modi said that he hopes this Bill is passed soon in the Parliament as a lot of hard work went into bringing this Bill which was brought about in existence in 2016. PM Modi’s rally in Assam is part of the first phase of the election campaign. Earlier in the day, PM Modi inaugurated and laid the foundation stone of 12 development projects worth Rs 1,500 crore in Manipur. While addressing a public rally in Imphal, the Prime Minister said he has visited the northeast region nearly 30 times in last 4.5 years and he really like talking and meeting people there. Prime Minister Modi said it is because of the negligence of past governments in Manipur that the project worth 19 or 20 crores has to be completed at the cost of 500 crores now. He said NDA government is going to change this laid-back nature.